Don’t stress over a broken iPhone 8. Gophermods offers worry-free repair services for all of your favorite Apple devices. No matter what the issue is, you can rest assured knowing our skilled technicians have the necessary tools and parts on-site to restore your iPhone 8. We fix the issue fast to get your mobile life back on track. The one year warranty covers any defects with the part replaced. This warranty is exclusive to only the parts serviced and replaced. In the event your part serviced is damaged again, the standard one year warranty coverage is void. Incidental damages are not covered under our warranty policy. In the event your device is broken again, the standard one-year warranty coverage is void. Having a good case on your iPhone or iPad is the best way to keep it safe. An excellent alternative is a tempered glass cover to sit on top of your screen. Our tempered glass is “unlimited”. If the tempered glass ever breaks or falls off, we’ll replace it at no charge. Plans starting at only $20 for almost every iPhone! In August of 2018 Gophermods has partnered with ShatterBuggy to begin providing on-site repair services at your home or business. 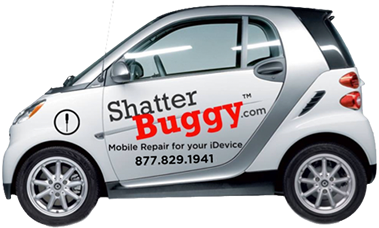 Book a repair appointment with ShatterBuggy today. Yes. We’ve had tens of thousands of broken iPhones, iPads, and Samsung phones brought into Gophermods since 2009. I would guess 98% of the devices brought into our stores are repaired. We’ve seen so many devices you don’t have to worry if we haven’t seen it before. On average, most iPhone repairs are finished within one to two hours of drop-off at any one of our stores. Unlike more repair facilities, no appointment is required and we bet you’ll be walking out in a few short hours with a repaired iPhone.